I often felt right out there dangling on the end of a twig when the conversation turned and friends started to discuss books. Having read very little of anything, I was afraid to open my mouth. It took years to discover why my sight a family joke? Someone would yell from the backseat of the family car, What’s that sign say? My answer, Huh, how am I supposed to read that, you drove too fast. I found it increasingly difficult to read words on the tellie. It turned out that I hadn’t taken to reading because I had Astigmatism, which wasn’t picked up until my thirties. Plus being partially dyslexic had me shy away from the written word. On my dreary train travels to and from work, DH, an avid reader, suggested I read. With my brand new glasses none of the letters had double lines and extra bits creating havoc with the prose. And DH chose a book he hoped would grab my interest straight off. My first book was The Sword Of Shanara trilogy, by Terry Brooks, and I was hooked! Our little family has seen a bit of the world and our travel memories stay strong within me. We lived in the Netherlands for about eighteen months with our two young girls, and after I’d exhausted all the English story books at the library, I sat on the edge of their beds and thought up stories to tell them. It wasn’t until we arrived home and I went back to work that I decided to put those stories down on paper. My freelance editor at the time, suggested my voice suited romance writing. I’d read plenty of them on the train, and not in my wildest dreams did I think I’d be capable. But with her help, we wrote, Found One Lover, which won the Emma Darcy award in 2000. Don’t think for a minute that because you’ve won an award you’ll immediately get published. Editors at Mills & Boon wanted changes and I made them, again and again, but still my voice, my style didn’t fit their genres. Hooray for Kate Cuthbert and Escape publishing, who accepted my work. The first one was Found One Lover, retitled, Finding Elizabeth. Then Home Truths and I’ve Got You. Coming soon on April 25th is the sequel to Home Truths, titled, Tumble Creek, which follows up with Brock and Sofie’s story touched on in the previous book. 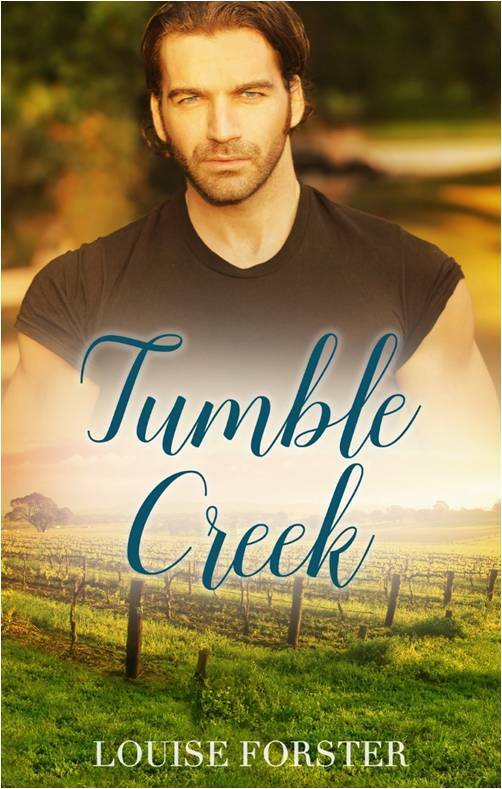 My work in progress is the 3rd book set in the country town of Tumble Creek. I’m half way through and enjoying where Takumi and Adele take me in their journey of discovering each other. In the sequel to Home Truths, Louise Forster returns to the sleepy country town of Tumble Creek with the story of a cop, a teacher and a mystery that will bring them together—or tear them apart. Art teacher and occasional life model Sofie Dove wants to know what’s up with Brock Stewart. Everything about the ex SAS soldier turned police officer seems to scream passion—and it’s all for her—but he just won’t express it. All she knows is that he has a past that still keeps him up some nights. After a semi-trailer crashes through Sofie’s house and the driver disappears into thin air, Brock insists he’s the only one who can keep her safe—but can he, when they can’t seem to trust each other? While Sofie works on figuring out why this man keeps giving her mixed messages, Brock is determined to find out who’s out to get her—as they both find out why falling in love is a bit like being hit by a truck.